Happy Tuesday! Time for some business…. First of all, I emailed all the winners of the Moo.com business cards, so check your email! I have heard back from two, and if I don’t hear by this afternoon I will draw new winners for the last set. Second of all, I promised you yesterday I would have some pictures of our barn space, but we had to reschedule our setup to Thursday (which happens to be my baby girl’s 6th birthday- eek!). So I will have some pictures for you on the day the sale starts. Better late than never! Guess what I am working on at the moment… a big gift for Emmy! I can’t wait to finish it so I can share it with you. If you follow me on instagram (cassie8978) then you have seen it. 🙂 I seriously could not be more excited…. I am really looking forward to seeing her reaction! Alright, now how about that boxwood sideboard this post is named after? I found this little piece at the thrift shop last week. I wasn’t feeling it. I walked by. I went back and opened the drawer. I hemmed. I hawed. I walked away. I walked back over and repeated the cycle. It still wasn’t speaking to me, but the price was too good to pass up, and it was a Sellers brand cabinet, so good quality, so I bought it. Here is the uninspiring piece in its before…. You see? It’s just so plan, and I am not a fan of the rounded edges, the finish was uneven and it’s ugly oak, not my favorite, and let’s not even talk about the ugly knobs, ok? Uninspiring. But the sweet deal convinced me I could do something with it. I knew it needed a fun color since there was nothing else to make it stand out. I had ordered Miss Mustard Seed’s Boxwood Milk Paint from the lovely ladies over at Vintage Shabby Chicks and was wanting to try it so this was the perfect chance! Because the finish on this was uneven, I gave it a quick light allover sanding, and of course removed those knobs! 🙂 I mixed up my paint and gave it two coats. I distressed it by hand and then I finished it by waxing it with a clear wax. I still was not really in love, so I gave it some funky colorful flowered knobs from Hobby Lobby. Here is the final product! I have to admit it’s still not one of my favorites, but it’s an improvement! And finally, I wanted to share my signature style board. My friend Darlene at Fieldstone Hill encouraged readers to try this out. Once Lisa helped me with my picture saving, I was able to create a collage….. I see a lot of neutral walls with lots of blues and lots of rustic touches. I also notice that I must subconsciously love having fresh flowers in the house. 🙂 It was fun to create and I encourage you to try it out! The buffet turned out just beautifull! I’m going to follow you on Instagram too! I think the little dresser looks great! The style board is a great idea and I love your style choices. Cassie that cabinet has such vintage charm and now with the new color it’s even better. And your style board is lovely, truly lovely. You made it into a gem! Beautiful job. What a lovely piece – she was just a sad little girl, and you turned her into a pretty young lady! 🙂 Love the knobs too – I think they really make the piece! Great collage too! Beautiful work!! Judging by your style board, that chest was meant for you to transform, and that you did, right down to the gorgeous knobs!!! I love that color. 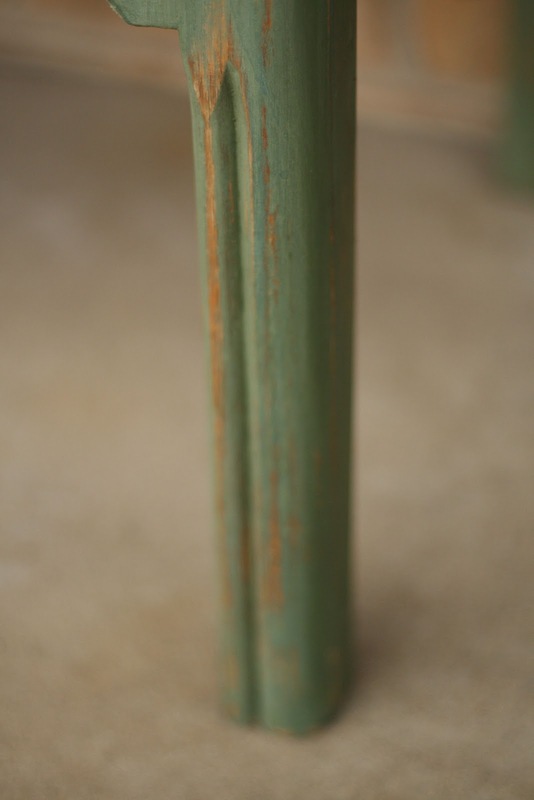 Although, I have to admit, I’m still a bit scared to try the milk paint, I’m unsure about the finish. Plus, I’m such a control freak the unpredictability makes me nervous. But, this is getting me one step closer! 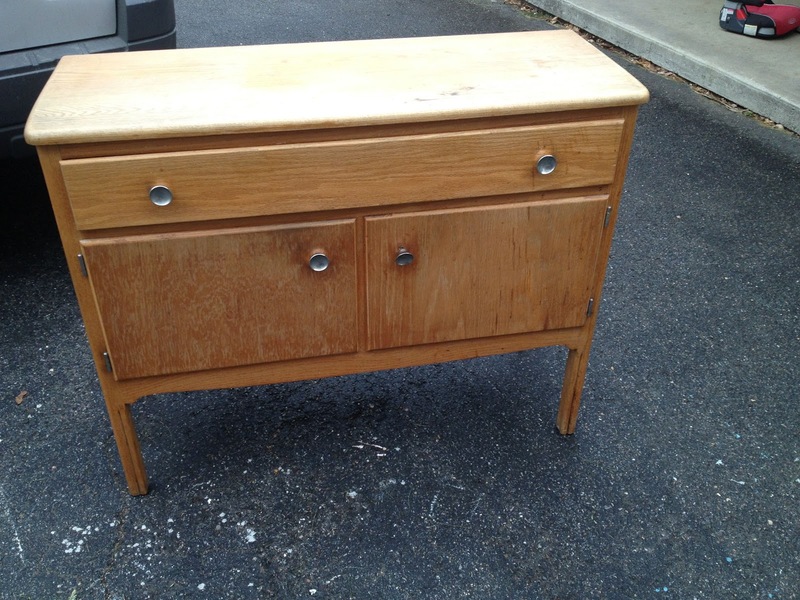 She may be a simple little sideboard but she’s cute! The colorful knobs were the perfect addition to finish her off. Very pretty color on the sideboard! Also – LOVE your signature style board….the deep colors and lots of white….fresh flowers…..the cool hip vintage vibe! 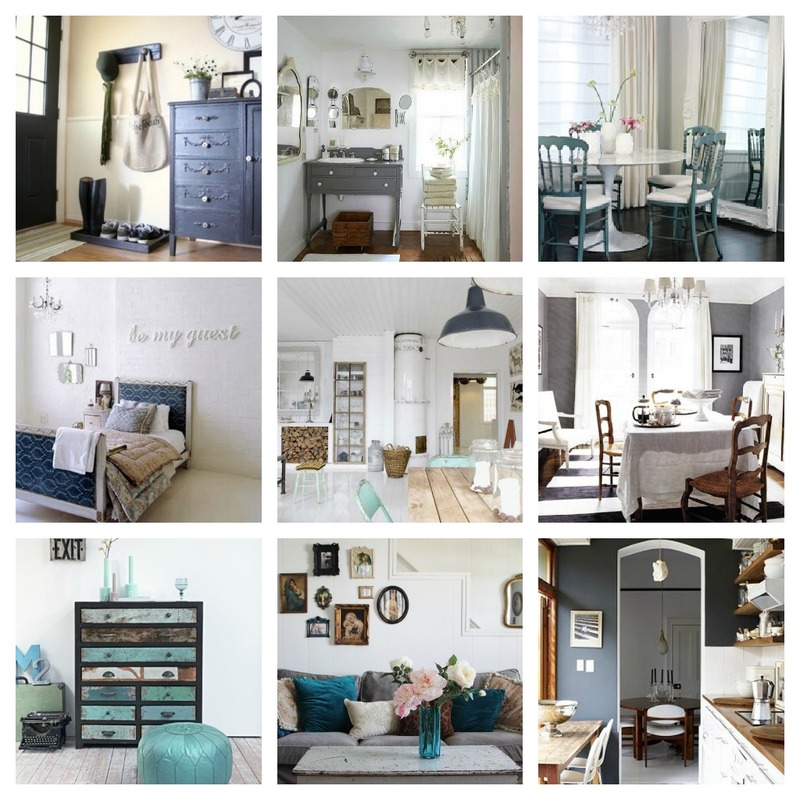 I love your style board…simple but gorgeous! Thanks for sharing. I love the mint green! Sometimes it just takes a little imagination to make a piece sing! You always do well at that! 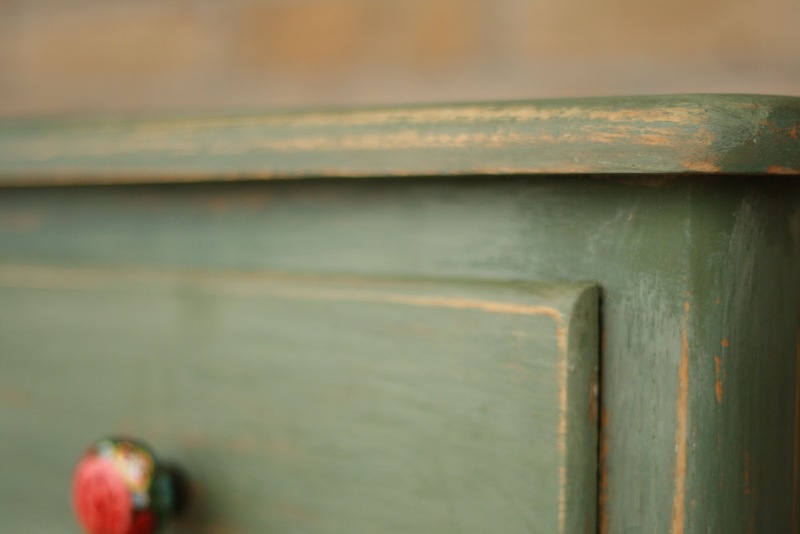 Those knobs give that sideboard a ton of personality! Good call. How fun to see your style board! I wonder if one of those would show me some trends, because my house in its current state is all over the place! Sooo much better now and the knobs are a nice addition! Love your style board! I like it! If it were a little taller it would make a great sink. You made a silk purse out of a sow’s ear! 🙂 What a cute little piece now…it would be adorable in someone’s kitchen! Glad you added your instagram address…heading over to follow you! 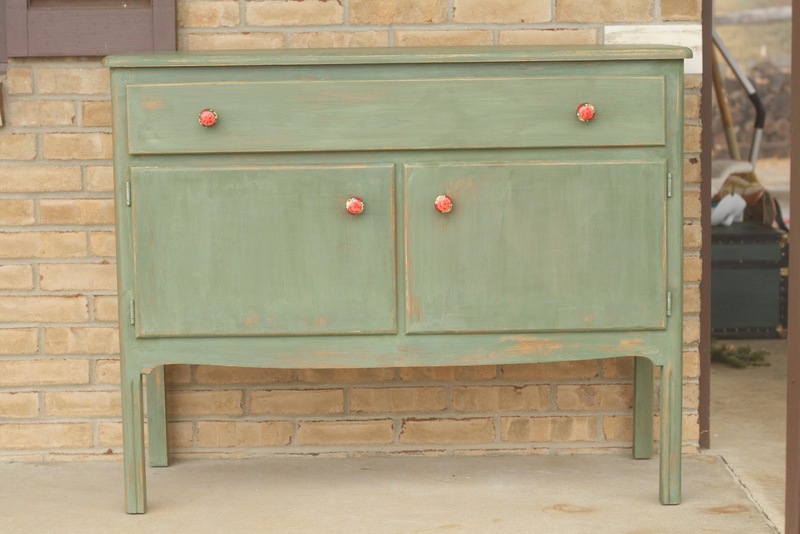 I kind of loved the lines of it even before you painted it, but it looks totally adorable now…love the knobs! even if it’s not your favorite, I am in love with the color. and those knobs give it a good pop! I love the color, but the knobs put it over the top. I bet it will sell fast. It certainly doesn’t look anything like it did to begin with. I really love it. Going to look into the style board too! Funny, I am going more neutral on all my walls and just pops of color instead of color everywhere. I must be getting old and can’t handle all the stimulating colors! Love your calming pictures. Wow. That was a very uninspiring “before,” but you still made it look charming and sweet! I need to go do this signature style board thing! Your board is fantastic-isn’t it funny what we naturally gravitate towards and don’t even consciously choose? Love your style board, every Frame I would love to have in my home. I only just figured out how to watermark my photos so don’t know how I’d go creating style board! Love the collage! And love your inspiration board. Let me just say too–that what you did with that piece is awesome!! Happy early bday to Emmy! I love the sideboard! the color is perfect! you did a great job as usual miss cassie! Glad you bought it even though it didn’t “speak to you”! Cuz it turned out gorgeous!!! 🙂 Love your collage, too. Oh, I think I need to read your whole blog. I love what I see. I have furniture I want to learn to finish – so many bloggers know how to do it. We are finishing the room above the garage to make into my crafting space. I can hardly stand it. Thanks for visiting me! I think you really transformed that piece Cassie! 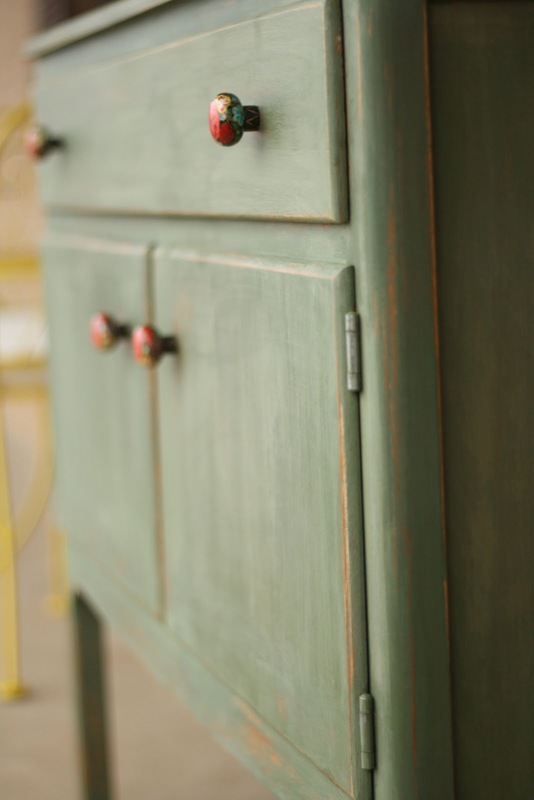 A pretty color that really suits it and brings life to it and the knobs make it more fun. I like your collage. Your signature board is very you! Hope you had a good day! 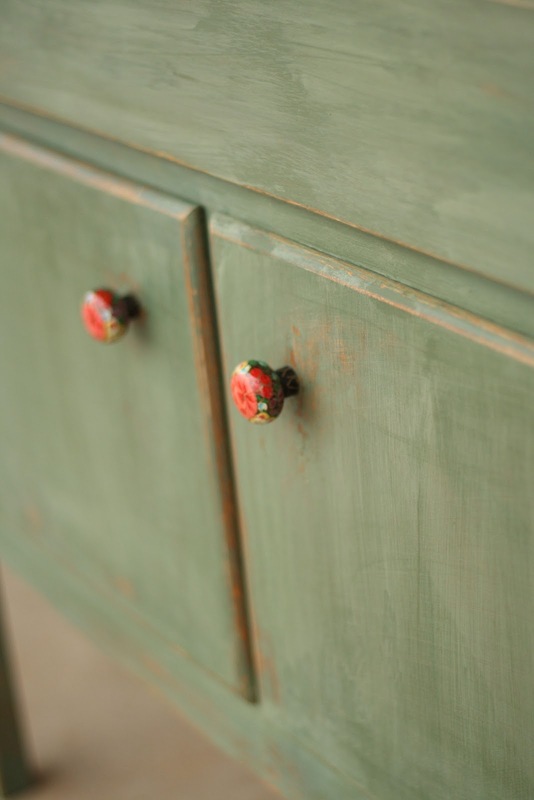 I think that soft green color is really pretty and I love it paired with those knobs. Someobody is definitely going to buy this! Oooh, your style board thingy is awesome 🙂 I love all of those! It turned out so cute! And happy birthday to your daughter!!!! i’m in love with the color and the knobs! i just used mms lucketts green and its awesome.